This time, I will show to you some pictures and tell about some of the social events that I follow. Each university must have a UKM (Student Activity Unit) of spirituality, one of which is my campus KMK (Student Family Catholic). End of each year, wealwaysholdsocial activitiesand participate inanyother social activities.KMK University of gunadarma, including of PMKAJ southern jakarta is all of the Catholic students in the area south jakarta. Jakarta has a wide variety of problems, including poverty, floods, and others. Therefore, we have held a social action by feeding 1000 people who are less fortunate. Where we do this activity is a suburb of Jakarta and all of the people we met during the trip that we think worth of food. In this division, we create a team to divide the region would be given food. How happy they are when we share food. We need to remember, do not often throw away food because there are many out there who do not have food. “We do not just talk, but we do directly”. Together with PMKAJ, all KMK collected from each campus who are interested in becoming a volunteer for the flood victims. 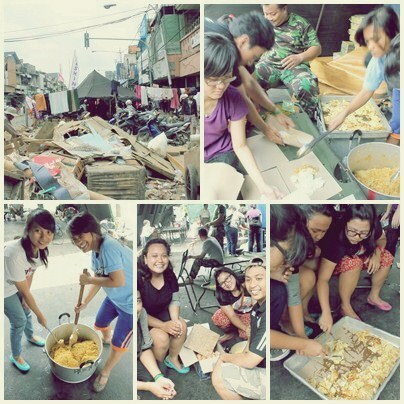 At that time we got the part region of the Kampung Melayu because there is still a shortage of volunteers. To get there, we use public transportation and car. We also bring food, medicine and the need for the baby. In the photo, we helped one of the post which consists of members of the military to cook food for lunch and then we wrap the food is then distributed to the refugees. The photos above are some of the social activities. There are many other activities, such as visits to the orphanage to share happiness with them to eat together, sing together, pray together, and others. Of social activities that I follow, I get inspiration in life that we should always be grateful for what we have because out there are still many people in need. So do your best to do everything that we still have today. It’s so happy to helping others.